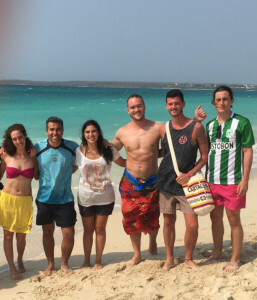 I Found My Inspiration in Cartagena – Backpackers United! Often when people hear of a recent trip I have taken they will ask me “how do you do it?” As though somehow what I have done is superhuman, like walking on water. I always try to explain that my trips are the culmination of a lot of little choices that structured my lifestyle around my great passion: travel. Usually this explanation goes right over their heads and they are left jealously looking at me as though I have something that is out of reach for them or some secret that I am unwilling to share. Eight years ago, when I first set out to refocus my life around traveling, stamps in my passport seemed like a far off mirage that would forever be out of reach. Along the way though I had been fortunate to be able to find inspiration in others and I look for it still. Just last week in Cartagena my inspiration cup was running over. A traveling friend, who I had only hung out with three times in as many years and always while traveling, set up the trip. She had been forwarded an email about a one-day 75% off sale from one of the airlines. By the time she got a hold of me it was 11pm and with only an hour to decide, I chose to throw my cares and responsibilities to the wind and book the trip. Upon arrival at our hostel we found out that there were an unusually large number of Americans there. As it turns out we were not the only ones who had pounced on the cheap tickets. A couple days later, I was lounging under a makeshift cabana on one of the prettiest beaches I’ve seen in years. I found myself hanging in the company of a small group from the hostel. Besides my friend, and myself there was a young guy from Miami who had tattoos of quotes and pictures and constellations to remind him of the countries he’d been to. There was a Turkish born American from Boston who had travelled frequently back to Turkey. A Brazilian girl who, despite being from a country that is currently suffering from a devalued currency, was still quenching her wanderlust. And then there was an unassuming young American from the rust belt who spent the first half of the afternoon listening to the travel stories that everyone else was telling. Stories about Patagonia, the Turkish coast, India and Southeast Asia. Finally when asked about himself he explained that he was a 23 year old small business owner. He had caught the travel bug as a kid and after getting a degree in computer science, or some such thing, he had been googling expanding job markets and he had come across niche commercial cleaning. So he set up a very elaborate website worthy of a fortune 500 company and he had gone out and approached potential commercial clients, passing himself off as a simple salesman, a cog in a giant wheel. Eventually he landed clients and hired employees but he kept up the charade never letting on that he was actually the owner of a very small company, for fear of losing the respect of his employees and the trust of his clients. I found this to be so inspiring, that he at such a young age had the guts to pull this whole thing off, and the wisdom to not get cocky. I’m sure that he had enough money to buy an airline ticket that wasn’t 75% off and I’m sure he had enough money to afford a nice hotel instead of a hostel, but he was humble. And I was most impressed that even though he had lived a successful and exciting life, he still sat for the first hour and just listened to everyone else’s travel stories. He inspires me. The next day I was on a speedboat to a small island to go scuba diving for the first time. I thought back to the time that my friend and travelling companion had met. It was on a couch in the lobby of a hostel in Panama, she was sitting and thinking of going in and I was sitting and thinking of going out. In that moment, as a raucous group of Germans was playing drinking games in the background, we could have been anyone, could have been from anywhere, and could have spoken any language. And then she asked where I was from and we spent the night walking around the island city and talking about life and traveling. She told me of how she had been in Honduras for the last few months living on a small island getting certified as a dive master. She was certified to open water diving, confined space diving and night diving. I was terrified. I’m from the Midwest, far from the ocean or clear water, the idea of descending in the water into pitch-blackness chills my bones. But in that moment I was inspired and so I made a promise to myself that someday I would go scuba diving and conquer this challenge. Fast-forward three years to the speedboat and the island and the instructions in the shallow pool and then to the dive itself. My brand new mask had been too foggy so I switched it for one that was too small and hurt my head, and the regulator was uncomfortable in my mouth and they had put too much weight on me so I constantly had to work to stay off the bottom. I didn’t see and sharks or sea turtles or any of the other things from all the Instagram pictures but I saw an amazing new world. The coral and the plants swaying in the current like a breeze and schools of bright blue fish trolling the bottom for food. I sucked down 45 minutes worth of air in 30 and I had an amazing time. That day I proved to myself just how much I am capable of. Lounging at the breakfast table of a boutique hostel a few days later I met an English couple from Brighton. They were artists who had travelled for six months through South America doing street art and when they got back home they started to get international attention. A famous fashion designer from Colombia had seen their work and invited them back to do some work with a local charity and she was going to incorporate it into her new swimsuit line. On the flight home I sat next to a gal from Atlanta who had had a miserable corporate job and had decided to quit and find herself, so she bought a one-way ticket to South America. It was just a chance encounter with a stranger on a plane. We both tried unsuccessfully to sleep through the flight, but because we were sitting side by side we ended up in line together waiting to go through customs. She told me about Patagonia and the mountains she had climbed and showed me landscape pictures that looked like they were out of a sci-fi comic book. She talked about the ups and downs of being on the road and how some people were so nice and others not so much. Some hostels nice and others not so much. I told her I had been diving and she told me that she had as well. Sometimes when you see someone post an incredible picture on Instagram you are tempted to feel jealousy like “why them and not me” but with travelers when you see an amazing picture it is always “look what they have done, now I know that I can do it to.” I’ve never bought a one-way ticket before; the idea scares me. It’s like letting go of the edge of the pool for the first time. It tests your strength and your nerve. And when you get home you realize that all of your friends have gotten pregnant or married and gotten on with their lives in your absence, you realize that you no longer fit in but maybe that’s because you’re not who you once were and I guess that’s the point. She inspires me.